At my day job, I work in IT as front-line support for a busy help desk and also perform a large share of the in-house software training. The best part of my job is watching the light bulb come on over someone's head. It's that "ah-ha" moment that makes me get warm fuzzies. So, it seems natural to me that my stories were taking me down a road meant to awaken more of those moments in the area where my passions lie...reading and writing. The Read Write Ponder series has been constructed to get people talking, much as a book club or discussion group would for a novel, but is designed to fit the hectic lifestyles that are so characteristic of millennials. The short stories can be read in under an hour by most teenagers, making them perfect for a quick read and a short discussion that fits into a single hour or perhaps two class periods. Teachers looking for a lesson plan for a substitute will find a unique read, story prompts for creative writing, and discussion questions to engage the minds of their students. I would love to hear back from educators about how I can improve these books. "Short reads, perfect for the airport or the lunch hour." "She gives you a day in the life of an ordinary person...you get to be the proverbial fly on the wall." You can get any one of my stand-alone short stories in the original Read Write Ponder series for free. Send me an email with your name, the school or organization where you teach, and your story preference, and I will send you a printable PDF copy. A man who's always seen the world through an artistic lens, where boat railings are covered in vermilion paint under cotton candy clouds, would like nothing more than to get validation from the son who's always thought his father was crazy. What if he isn't crazy at all? What if faeries are real? What if pixies did steal his shoes? Sometimes fathers and sons have lenses that will never be focused the same. 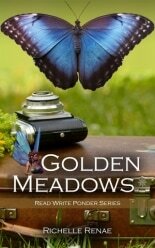 Golden Meadows explores the notion of defining reality. Who establishes the rules, and when is it okay to live outside the parameters of normality? 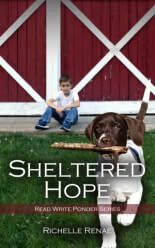 Join the author in a discussion on GoodReads. Sometimes we learn things from the least expected person and just when we least expect it. When a woman visits a foreign country for the first time and heads out to the bazaar to purchase a gift for her host family, the host's son joins her to act as interpreter. The boy teaches her enough common phrases to allow her to communicate with the vendors, and not get swindled, but it isn't until she trips over an old crone selling wishes, that she learns the most valuable lesson of all. 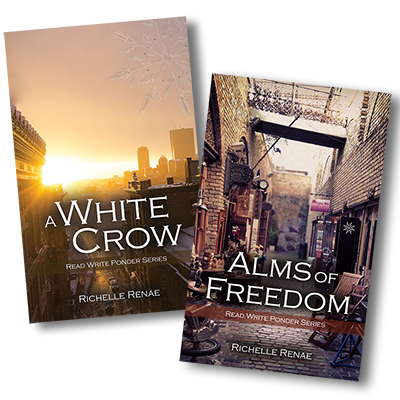 Alms of Freedom explores the notion of freedom and what it means to be free. Mac and Lisa are a young, recently engaged couple still working out the kinks of their new relationship and coming to terms with the challenges of living together in the big city. When Mac casually borrows the one item that Lisa attributes all her success to, both their lives are dramatically affected. A White Crow explores the notion of luck and the dependency of relying on it for success.